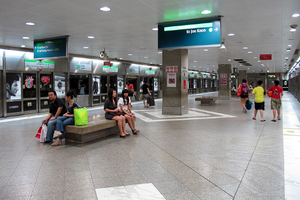 Bugis (EW12/DT14) is an underground Mass Rapid Transit (MRT) station on the East West Line and the Downtown Line. 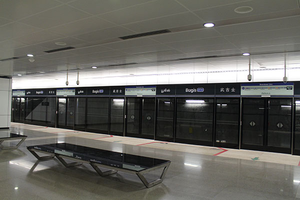 It is the third station to have travelators within the paid area as the distance between the East West Line and Downtown Line platforms is relatively long. On 18 July 2012, two Chinese workers died after a temporary scaffolding, about 4m high, used for the construction of the new Downtown Line station subway link roof slab gave way. The incident happened at about 6.50am. The eight other injured workers who were working on top of the structure, were sent to the nearby Raffles Hospital before rescuers arrived. They had minor injuries and five of them have since been discharged. Of the remaining three workers who were warded, one suffered from abdominal and chest injuries, while another suffered a back injury and the last had a finger injury. Seven of the injured are from Bangladesh while the eighth is from China. The Ministry of Manpower (MOM) has ordered all construction work to stop, while the Building and Construction Authority (BCA) has revoked the construction permit for the site while investigations are underway. MOM said that based on preliminary information gathered, workers were pouring concrete, also known as the casting process, into the formwork when the structure supporting the formwork collapsed. The formwork, located between the new and old sections of the station, was part of the structure being built to form the underground linkway, which is about three to four metres deep. The area affected is localised, measuring about five metres by 10 metres and the entire station is about 7,500 square metres. The Land Transport Authority said the station structure is substantially complete and structurally sound, and that the incident posed no risk to surrounding developments and the public. Ephemeral by Patrick Chua, attempts to make different experiences of commuters passing by the artwork in their daily journey. ↑ "Two dead, eight injured at MRT construction site". Channel NewsAsia. Retrieved 18 July 2012. ↑ "Two bodies recovered from MRT work site". Channel NewsAsia. Retrieved 18 July 2012. ↑ "MRT worksite accident: why scaffolding collapsed". Channel NewsAsia. Retrieved 18 July 2012. ↑ "Downtown Line 1: Art-In-Transit". Land Transport Authority. Retrieved 16 October 2013.